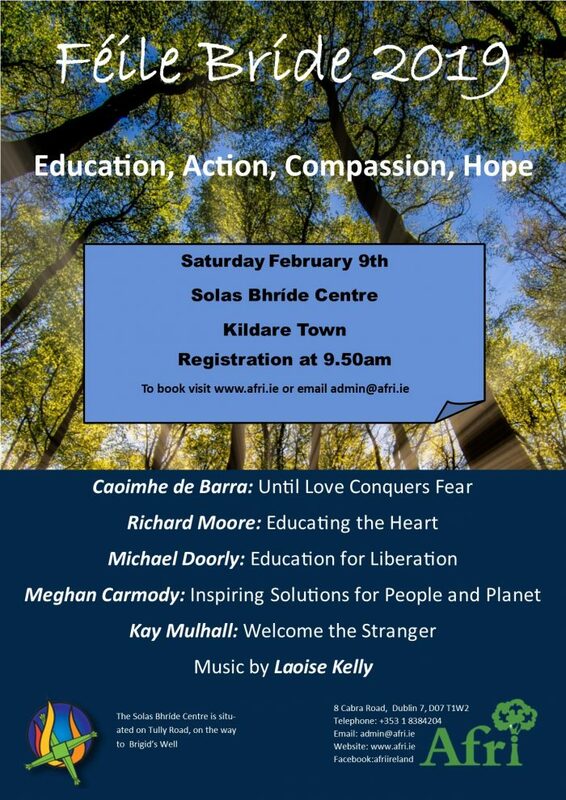 Féile Bríde 2019 will take place in Solas Bhríde on Saturday, February 9th with Registration at 9.50. The theme of this year’s Féile is Education, Action, Compassion, Hope. Such people and actions – as well as Laoise Kelly’s magical music – bring us hope, the vital antidote to cynicism and despair. A new year, a new spring and a renewed sense of purpose can see us decisively turn the tide in 2019. 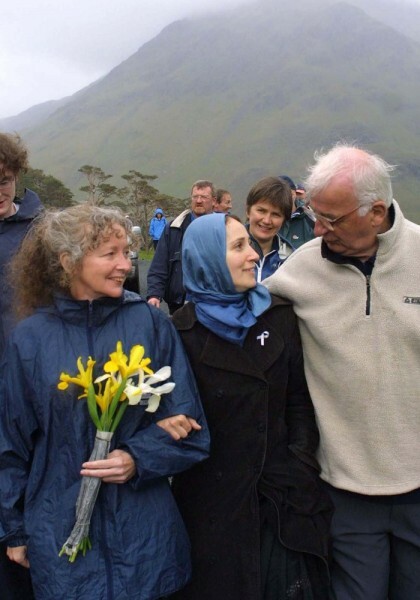 Sunny and Peter Pringle, the last person to have been on death row in Ireland, have devoted themselves to promoting healing, peace and reconciliation. Together they have established The Sunny Centre – a sanctuary for others who suffer injustice, especially people who are wrongly convicted of crimes they did not commit and have spent time under sentence of death. We will hear their extraordinary stories at Féile Bríde this year. 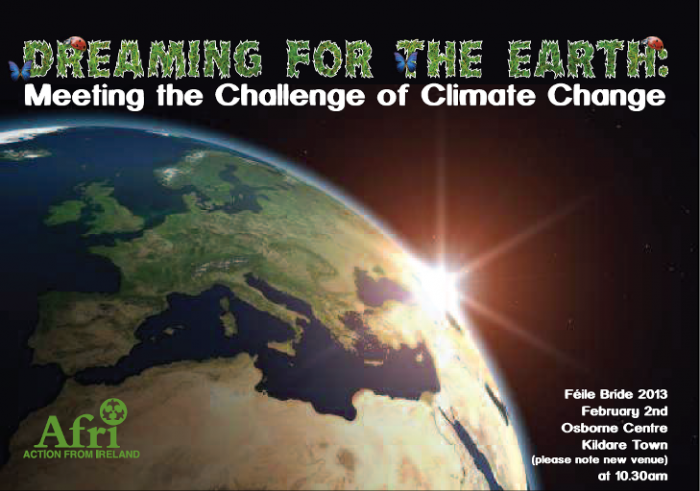 Other speakers include the distinguished academic and activist Peadar Kirby, who plays a leading role in the Cloughjordan Eco-Village; UCC Professor Emeritus and life-long peace activist John Maguire; Hanny Van Geel of La Via Campesina, which promotes the rights of peasant communities around the world, and who describes herself as ‘rooted in farming’; and Rose Hogan who has a life-long commitment to agro-ecology and sustainable agriculture. In a world marred by war and the woeful destruction of our exquisite planet, Féile Bríde is but one example of the many, many people and groups throughout our world who hope for and work towards a better future, a more just world and for the light to overcome the darkness. 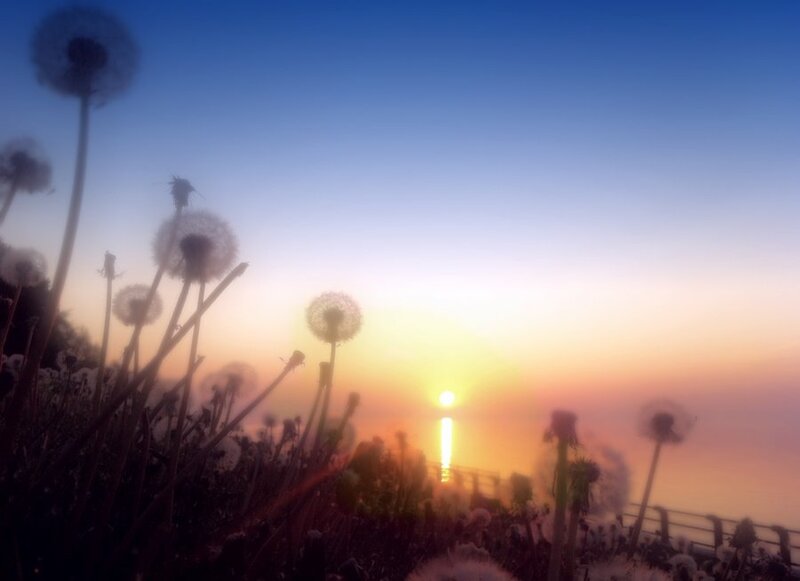 And as the Spring birdsong heralds the end of another winter, we will also have music because, as Hans Christian Anderson said, “where words fail, music speaks”. 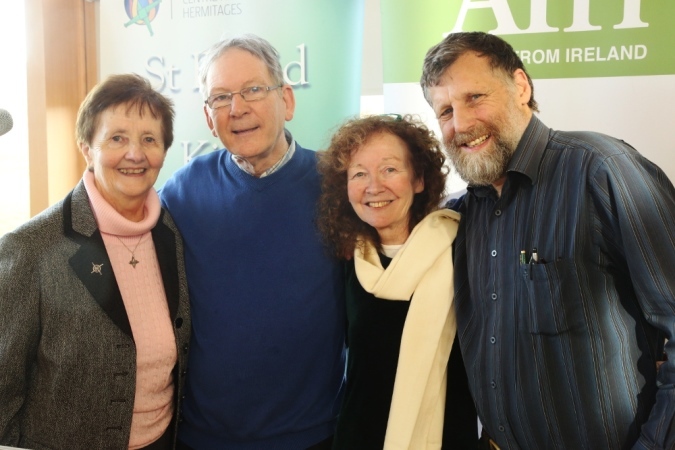 Afri’s Féile Bríde conference is part of a week long events being held in Kildare organised by the Brigidine Sisters and Cairde Bríde. 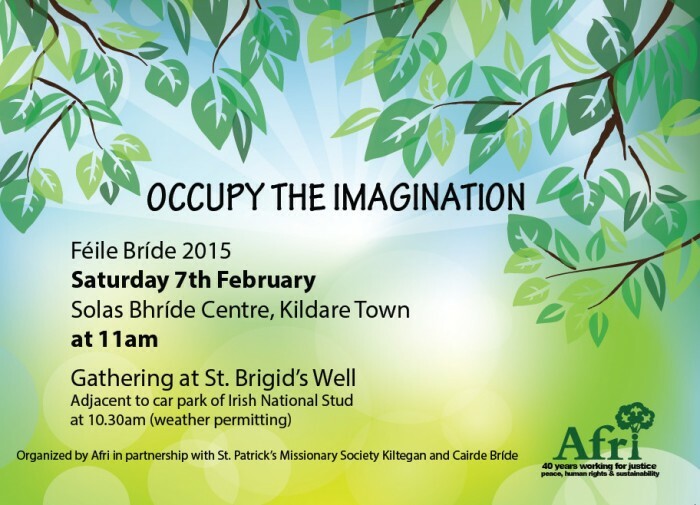 For information about the other events that week visit the Solas Bhríde website or download their programme Feile Bride Programme. Imagination and celebration were the order of the day at our 22nd annual Féile Bríde gathering in Kildare. ‘Occupy the imagination’ was the theme and the new Solas Bhríde a cause for celebration – built with the utmost attention to detail, as explained by Rita Minehan, in the teeth of the recession – a prizewinning example of a sustainable building in the heart of the Curragh. 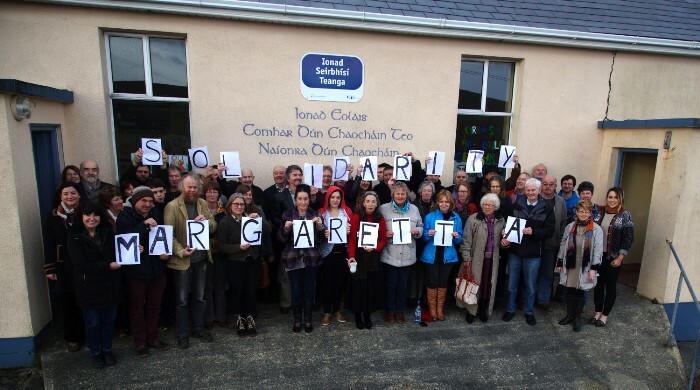 Warmth and welcome is added in abundance by Mary, Phil, Rita and members of Cairde Bríde who continue the tradition of hospitality for which Brigid was renowned. Bruce Kent and Colin Archer, who have devoted most of their lives to promoting peace and – daringly – to the abolition of war, gave dynamic and thought provoking presentations on the extent to which ‘the world is over armed and peace is underfunded’. Bruce, who is in his 8th decade is an inspiration, with his indomitable spirit, his great sense of humour and his constant commitment to the cause of peace. The essence of Bruce’s presentation was that ‘unless war is eliminated, the human race will be’ and so he has founded the Movement for the Abolition of War. This may seem like a far-fetched idea but so did the elimination of the slave trade when small groups of Abolitionists met in various parts of the world in the 17th century. (Of course we now have a new slave trade in the form of human trafficking but – unlike the slave trade – it is generally regarded as the odious crime that it is). Former speaker at Féile Bríde, Kathy Kelly has just begun a 3-month prison term, having been arrested when she went to deliver a loaf of bread and a letter to the commander of Whiteman Air Force base Missouri, which operates drones over Afghanistan. Co-coordinator of Voices for Creative Nonviolence, Kathy Kelly will turn herself in to the federal prison camp in Lexington, KY on Friday, January 23. She will begin serving a three-month sentence for her June 1, 2014 protest of drone killings at Whiteman Air Force Base, in Missouri. Féile Bríde 2015 will take place on Saturday 7th February in the Solas Bhríde Centre in Kildare town. 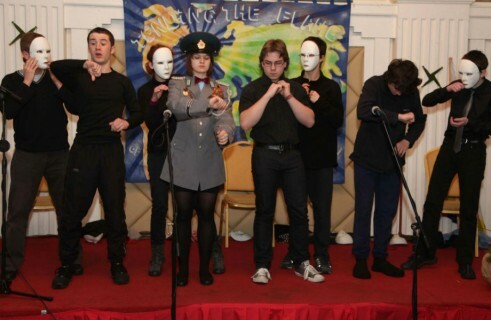 The title of this year’s Féile Bríde is “Occupy the Imagination”. ‘Another world is possible’ – A simple and confident expression of an ability to step outside the existing paradigm and imagine an alternative! This ability to imagine, to voice the imagined, and to take action to manifest it, is a wonderful gift and holds the potential to a life well spent; a seed full of potential for change. Whether it be in the small fields of power within which we operate on a day-to-day basis or whether the net of imagination is cast farther to embrace other fields and other people, the role of the imagination in creating change is a vital one. Speakers at this year’s Féile Bríde include those who similarly inhabit their dreams and make them visible. Bruce Kent, a name synonymous with peace-making and founder of an organisation that challenges the military mindset of countless generations, the Movement for the Abolition of War; Colin Archer of the International Peace Bureau, another life-long peace activist who similarly and consistently presents the kind of world that would be possible if we stopped sacrificing life in its many forms to the god of war and chose instead to put our focus and energy into the protection of life; Emanuela Russo, member of the Via Campesina and founding member of Food Sovereignty Ireland, by word and example occupies the imagined world where food production is in the hands of the people in respectful alliance with Mother Earth; And Salome Mbugua, working to bring about the world she dreams of in common with Brigid where justice, peace and human rights are upheld and hospitality is a belief in practice. This year’s Féile Bríde aimed to mark the issues of “Life: Source or Resource-Enslavement versus sovereignty.” The day started with the beautiful music of harpist Fionnuala Gill as the Brigid flame was carried into the conference hall. 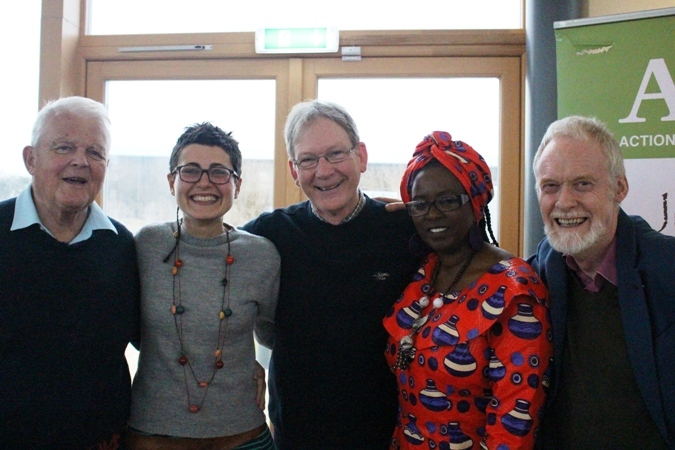 The event made connections across borders, nations and nationalities, attracting speakers and partners from East Africa to the West of Ireland, in order to tackle together the unequal distribution of resources and the threats to food sovereignty. 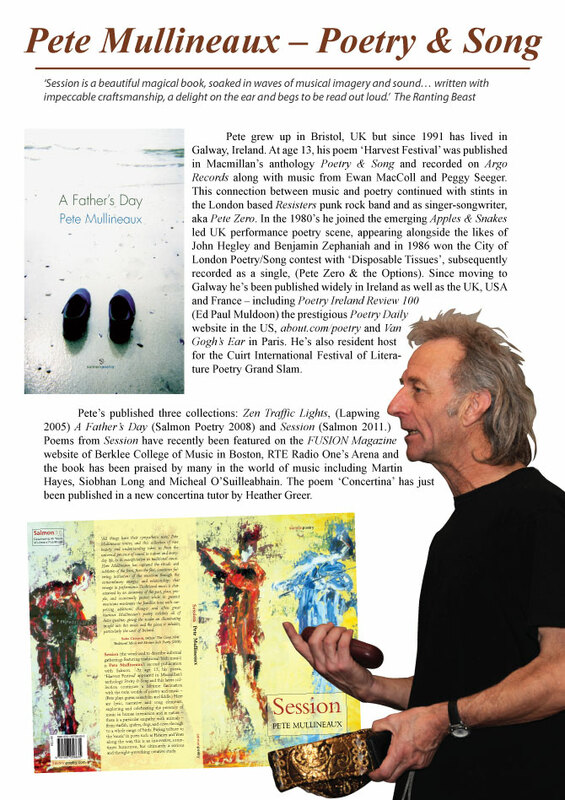 Pete Mullineaux, poet and dramatist, read out some of his poems at Afri’s Féile Bríde on Saturday 8th February in Kildare. These poems are republished here with his permission. Féile Bríde 2014 will take place on Saturday 8th February in the Osborne Centre in Kildare town. 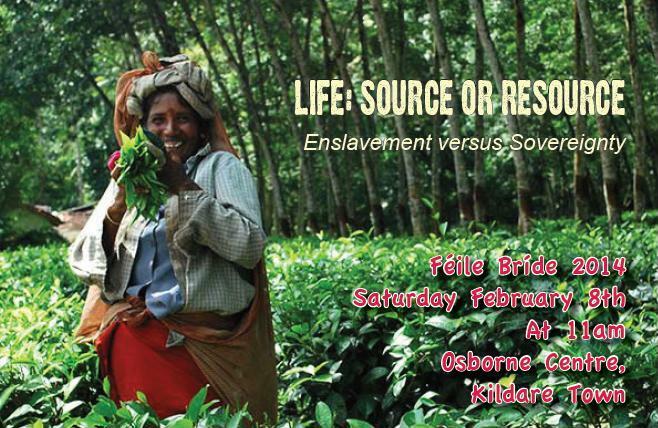 The title of this year’s Féile Bríde is “Life: Source or Resource – Enslavement versus Sovereignty”. 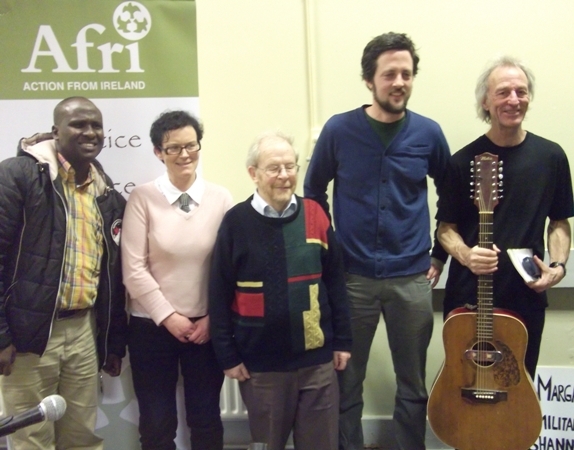 Afri’s 2013 Féile Bríde, “Dreaming for the Earth: Meeting the Challenge of Climate Change” was held in the new venue of the Osborne Centre, which is beautifully surrounded by a lake and native Irish trees. 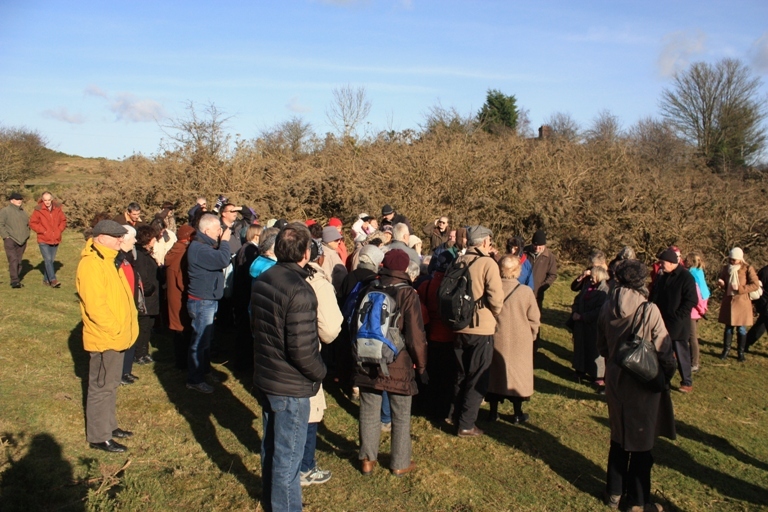 This year the conference was aimed at tackling climate change, and opened with John Feehan, an expert on the Curragh, giving the history and uses of the Curragh, and then bringing the participants to the Curragh to explore the landscape for themselves. John strongly encouraged locals interested in preserving this public space, to consider forming a taskforce to care for the Curragh, in particular, to tackle the rampant furze. 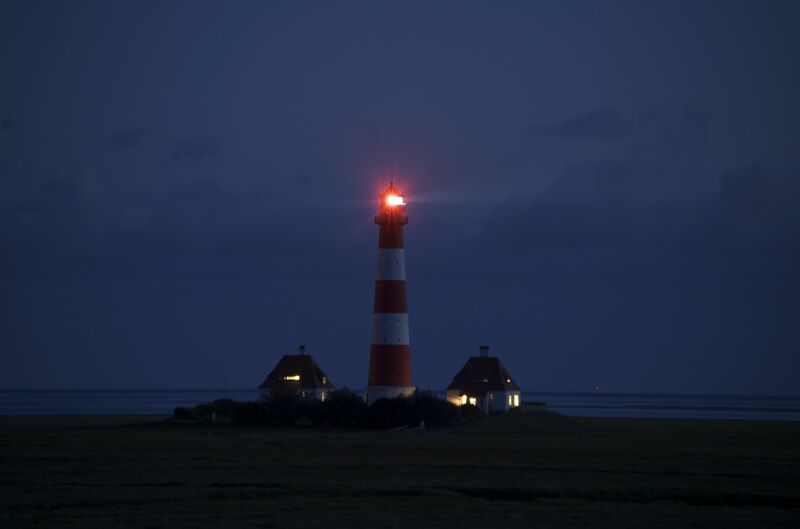 The wonder and awesome beauty of our planet is also a reminder of her fragility, uniqueness and the urgent need to protect her. 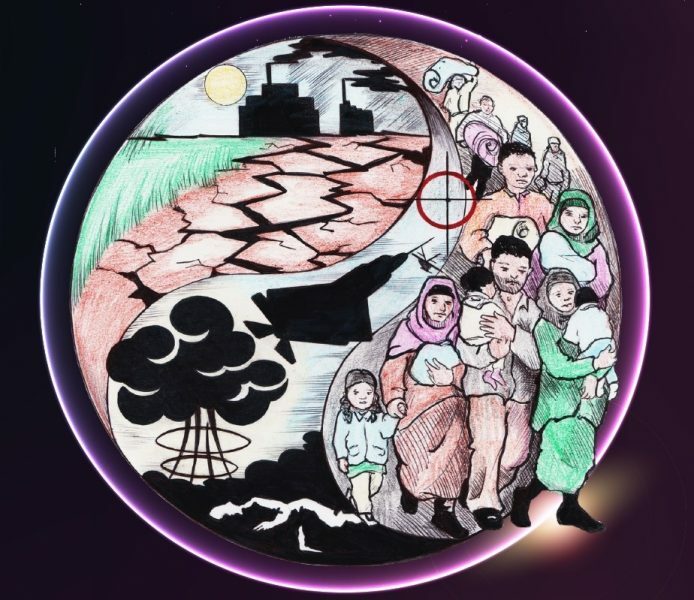 Our planet home is blessed with sufficient abundance to care for all but is increasingly reeling and groaning from relentless exploitation and abuse. This year’s Féile Bríde is a celebration of fire and food. There will be contributions from Mayra Gomez from Bolivia, who has worked around the world on peace and justice issues, and from Roisin O’Brien from Be The Change. 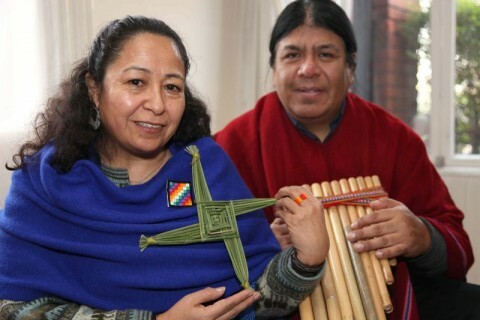 The programme also includes a short theatre piece, musical contributions from a Bolivian musician, some planting, workshops, and the lighting of the Brigid Flame! 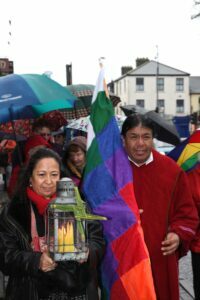 Mayra Gomez will light the flame at the new Solas Bhride Centre site at 1pm and registration will follow at 1.30pm at the Derby House Hotel. You can book on by downloading our brochure: Feile Bride Brochure 2012. Afri PEACEMAKER 2011 is now available! The 2011 Peacemaker is now available here. The Peacemaker covers the highlights of 2011 including the Possibilities Civic Summit held in April and attended by the Dalai Lama, Mary Robinson and community activists such as Rita Fagan and John Monaghan from Rossport, as well as reports on our regular events such as the Féile Bríde, and the Famine Walk. We also include updates on our recent campaign. Please contact the Afri office if you would like to receive a hard copy of the publication.